ST Installation is currently working on a solar panel installation project at the Oak Orchard Water Treatment Facility near Syracuse, New York. Prior to installing the solar panel arrays, STI had to first make sure they would not strike any underground utilities during the process. They had previously worked with Ground Penetrating Radar Systems, LLC, and knew they could penetrate beneath the surface to find the lines. When they called the technician that covered the Syracuse area they were pleased to hear he was available to complete the project well within the needed time frame. 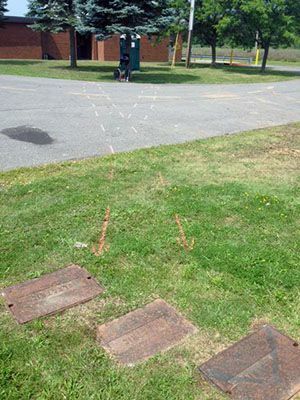 Jim Bell of the Upstate, New York office mobilized to the site and began marking out all of the utilities that were located in the area the solar array would be located. In addition to finding underground utilities, and storage tanks, Ground Penetrating Radar Systems has the ability to locate and map out rebar, post-tension, and conduit prior to saw cutting and trenching, and in some cases unmarked graves.